Robert R. (Bob) Ames is a retired Vice Chairman at First Interstate Bank who is now a commercial real estate investor, developer and car collector in Portland. Mr. Ames was instrumental in renovating what was once called the River District into the Pearl District. Mr. Ames was part of a group that brought the CART Indy Car World Series to Portland in the 1980s, featuring drivers such as Bobby Rahal, Danny Sullivan, Emerson Fittipaldi and Michael Andretti. He is also an avid car collector. Mr. Ames is the son of Arthur Gordon Ames and Elsie Wilhelmina Steinfeld. 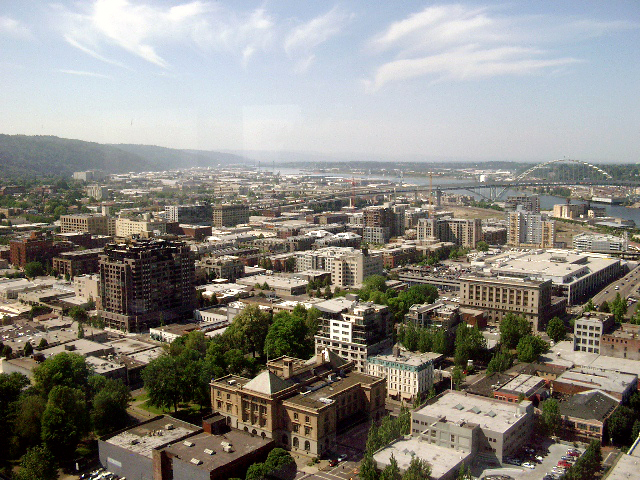 Aerial photograph of the Pearl District in Portland taken from the U.S. Bank Tower. Source: Wikipedia.